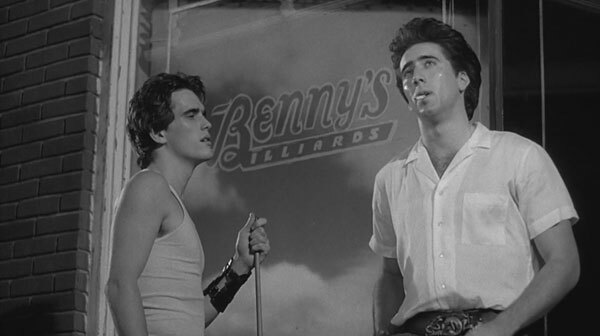 Nic may have been one of the leads in his Uncle Frankie’s subsequent Peggy Sue Got Married (1986), plus he enjoyed a more prominent supporting role in Coppola’s 1984 disaster The Cotton Club, but Rumble Fish gets on this list as it is a way better movie for a slew of reasons – none of which really involve Cage. Cage revs up the histrionics in this murder-melodrama that – aside from its streadycam-dominated virtuoso beginning – ends up being quite a dull affair. 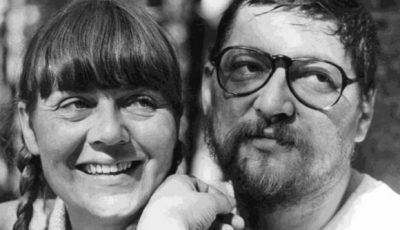 Having said that, had Nic not been in this one it may have turned out a whole lot worse. Despite being wired to the hilt throughout most of this pseudo-noir double-cross potboiler, Nic ends up being the romantic voice of reason when he closes the movie with his second Elvis impersonation. 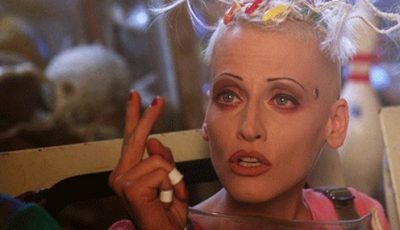 Whatever one may think of Cage and Lynch’s excesses, it says something about the actor when he can hold his own in a cast that includes Laura Dern, Willem Defoe, Isabella Rossellini and Harry Dean Stanton. 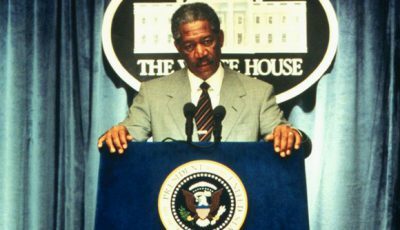 A solid performance in a strangely lacklustre film about a huge historical event. 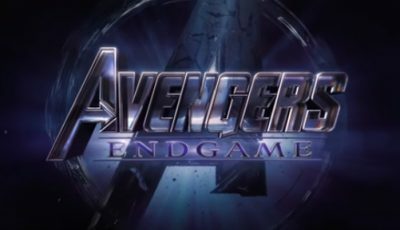 The fact he spends most of it pinned under rubble means the more mobile rescuer Michael Shannon somehow manages to steal the show in the movie’s second half. Putting Valley Girl (1983) aside, this was arguably Cage’s first major leading role (which he shares with Matthew Modine) and he didn’t do a bad job of it. Of course he is helped by the fact that it’s a pretty good movie. Sure – Nic ain’t no Harvey Keitel … and he doesn’t get his gear off. Nor does he go through moments of gruelling self-inflicted anguish. Furthermore, his character isn’t hit at the end of the movie. Indeed, when one thinks about it, Herzog’s version is really nothing like Abel Ferrara’s 1992 study of drug-fuelled despair and depravity. Nevertheless, it is a robust performance by Cage. 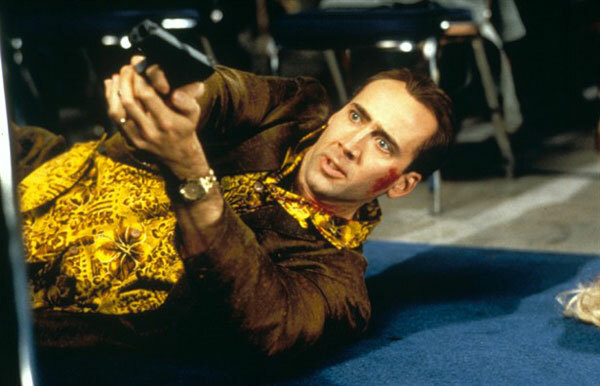 While most would probably prefer Woo’s identity switcheroo Face/Off (1997) to this intelligently-made World War II actioner, Cage delivers a stunning performance as the battle weary sergeant who, until his demise near the end, proves he has balls of steel. Cage is great as the obsessive-compulsive disordered Roy Waller, an LA conman who ends up getting completely shafted by those he assumes are closest to him. A measured and sympathetic performance in a film which suffers from a plot twist that is kinda preposterous. A solid comic performance in the Coen brothers’ second movie – one that truly suggested he was destined for bigger things. 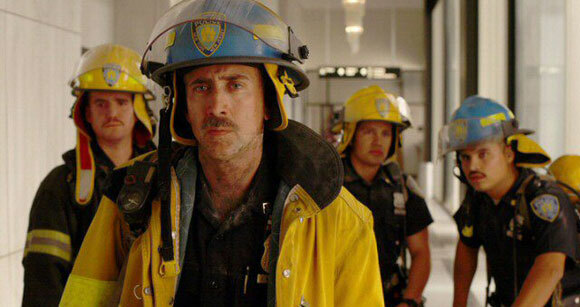 Arguably one of Nic’s greatest screen performances ever as the burnt out New York paramedic whose life teeters precariously close to the edge of psychological meltdown. 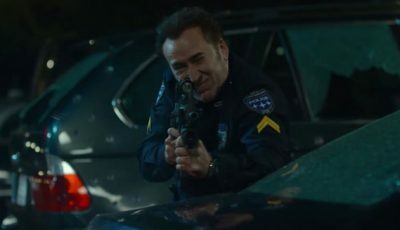 Once again Cage’s abilities shine in a talent-ridden environment that includes director Scorsese, writer Paul Schrader, cinematographer Robert Richardson and fellow thespian John Goodman. Pity it was all mis-read at the box office. Wow, that’s a very specific list! Not sure I’d go with DePalma as an A-list director, but he was at one point. I totally agree about Snake Eyes, which falls apart after the chaotic opening sequence. 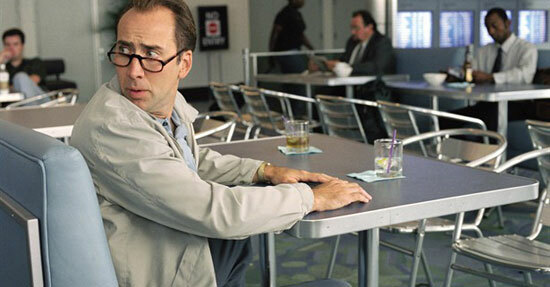 Love the inclusion of Matchstick Men so high; that’s one of Cage’s underrated roles. I agree about Matchstick Men – one of Ridley Scott’s best films for me. Oh my goodness, I’ve missed out on all of these! I can’t complain that he’s always in terrible movies then, ahah. Great stuff Mark, lots of recommendations here. …but you’re right, in among the “turds” there are some shining lights and Mark has highlighted some of the best. Raising Arizona and Bringing Out The Dead couldn’t be more different but they are both such enjoyable films in their own right. They also highlight just how good Cage can be as an actor. As all who know me, know I’m a huge Nic Cage fan and supporter I think he is such an engaging actor. He gets often slammed for picking bad films, but when he acts in a well written film wow, does he nail the performance like none other!! As displayed here in this fantastic list. Two films I would include, where he is exceptional – Red Rock West and Valley Girl. After the inclusion of Bad Lieutenant and Windtalkers I was prepared to sneer at this list as some kind of sarcastic commentary on Cage’s career. You saved it with your #1 pick, one of the best Cage flicks ever, and one of Scorsese’s most undervalued movies (IMO). @Rodney, you have to over look those two movies, he has Bringing Out The Dead at number 1 thumbs up and also included Wild At Heart and Matchstick Men, so forgiven, lol. Bringing Out The Dead is definitely one of my favourite films featuring Cage, if not, THE favourite. 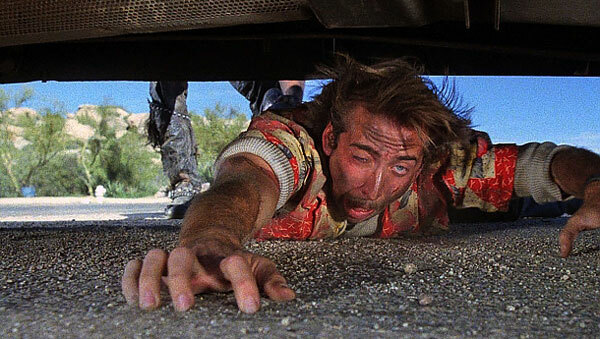 Certainly, Raising Arizona gives it a run for its money as one of the best things the Coen’s have ever done. Adaptation and Face/Off with directors Spike Jonze and John Woo would replace World Trade Center and Snake Eyes for me. I really don’t much like the guy or his movies but I think Herzog got the best out of him. 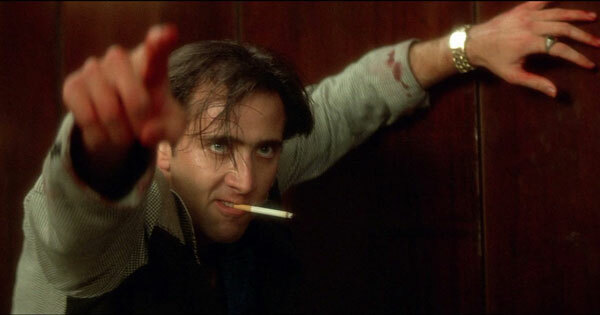 Then again, I still need to see Wild at Heart! I have literally seen zero movies on this list. That’s just fine with me though because I can’t stand Nicolas Cage. I think he’s a hack and most of the time, completely intolerable. @Evan, well he’s not for everybody. @Dan , I disagree I would replace those two with Red Rock West and Valley Girl. ‘Bringing Out the Dead’ is an overlooked masterpiece – delighted to see it at number one. Must say that I think ‘Peggy Sue Got Married’ and ‘The Cotton Club’ are both great, though I know you were just picking one per director. Totally agree about Bringing Out The Dead. It’s one of my favourite Scorsese films along with a couple of others that most people don’t rate as highly as Goodfellas, Raging Bull, Taxi Driver etc. Those are After Hours (my favourite) and The King of Comedy. 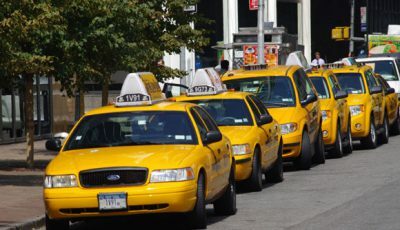 Taxi Driver is a close third. I haven’t seen a lot of these, but I wasn’t at all surprised by your top two. Both are such great movies and performances, especially Bringing Out the Dead. It’s a bit underrated, that one, but it is sheer brilliance. Can I assume the only reason Leaving Las Vegas isn’t on this list is that you don’t count Mike Figgis a major director? @all … appreciate the feedback – nice to see there are others out there who liked Bringing Out the Dead as much as I did. @Neal … you SHOULD do a Nic Cage top 10 list – I for one think it would make pretty interesting reading. Definitely Con Air and Lord of War would be in my selection. @Rodney – I thought he did pretty well in Windtalkers (or should it have been called Sgt Joe the Psychopath Guards an Indian? ); didn’t mind the film in the end either, although it took me a couple of years. As for Bad Lieutenant, I found that once I got past the “This isn’t Harvey bias” I was OK with Nic in it, even if Herzog failed to capture any of Ferarra’s sleaziness. @Dan H, Dan S and jjames36 – yes, we could probably get into a lengthy discussion about what exactly constitutes A-list. Admittedly I just went for the bigger names. Therefore if the list was any longer I most likely would have gone more for Norman Jewison (Moonstruck), Barbet Schroeder (Kiss of Death) or Joel Schumaker (8mm) before Spike, Mr Figgis or somelike Gore Verbinski (The Weather Men). 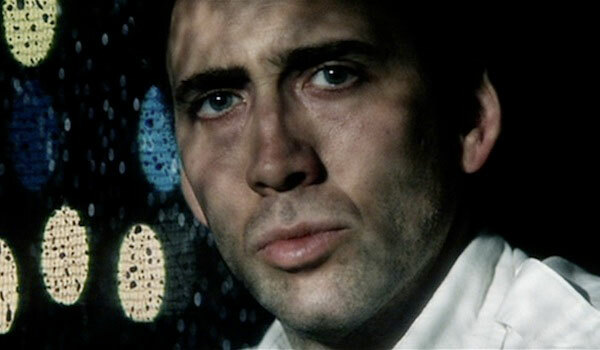 Cage is undeniably an intriguing actor. And even if he doesn’t convince you, like the great movie stars he can be damn entertaining, even when juggling mediocre material. @Mark, thanks for the request it means you must like my writing 🙂 I think I will do a Nic Cage top 10 see how I fare…..be on the lookout! I too have a soft spot for Cage. I like the list, it’s definitely off the beaten path so to speak. I’d have Knowing as my number one. IMO, its one of the all time under rated films. And he is simply electric in that film. Great list, and I totally agree with your #1. Also, I was happy to read, “…he can hold his own in a cast that includes Laura Dern…” Laura Dern is such a fantastic actor. She was interviewed on Marc Maron’s WTF podcast recently, and it really is fascinating. She talks about her method of acting, choosing roles, and growing up with parents Bruce Dern and Dianne Ladd. It’s still available for free on the WTF website, I believe. I love Birdy and Wild of Heart of those performances you mention. Cage’s recent acting in Joe (2013) has been getting a fair amount of buzz, a return to form of sorts, after a string of money-grabbing duds. @ Mark, request granted…….stay tuned! !